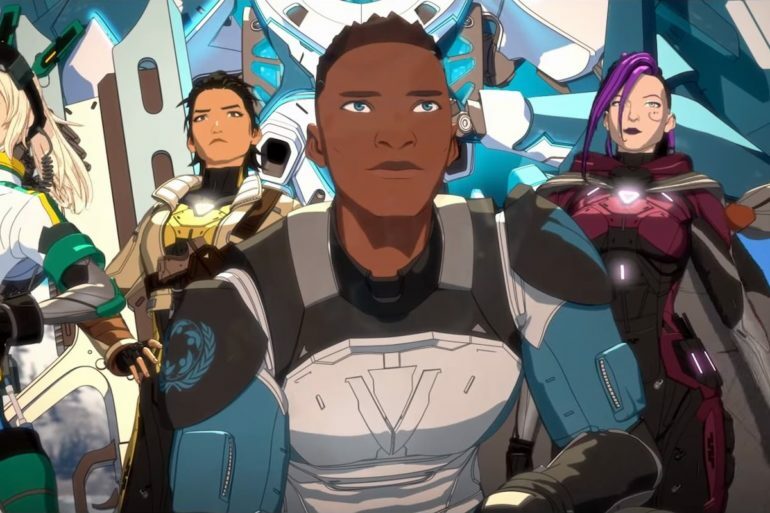 After the scare from the previous episode, the audience feel the same as the rest of the gen:LOCK forces: distraught for Cammie, wondering what the hell was that, and what does this mean for the future of the gen:LOCK programme and its hopes of success? In the episode ‘The Best Defense’, the audience sees Cammie trying to deal with the mental stress of her encounter with Nemesis, while the Vanguard prepares to go on the offensive. ‘The Best Defense’ opens up with Cammie in the middle of a nightmare, being chased by Union forces and Holon frames while Nemesis hangs over her in a cloud of nanomachines. She wakes up startled, but is quickly comforted by her loyal robot pet and one single thought as she looks over schematics for the Holons: ‘You’re not going to get me again,’ a phrase she regularly repeats throughout the episode. After struggling out of bed into the Holon, she finds herself irritated at being the weakest of the recruits, having difficulty while everyone else seems to be doing well. In a moment of weakness, she ends up accessing the Holon’s digital mind, where she briefly contemplates deleting her memory of Nemesis before going into the Holon’s inner workings and adjusting it to the point where she does exceedingly well at training, but gets too aggressive, assaulting her team and causing the doctor to deactivate her Holon remotely. In the cafeteria, the team grill her for trying to rewrite her mental code, and that they can look after her since they are used to combat. They also learn that they are all affected by similar dreams of being surrounded by Holon frames. They don’t have a lot of time to look too deeply into the matter as they are called into a briefing to attack a Union factory. Chase and Miranda share a moment of privacy before the team are deployed the next morning. Here, they rescue a group of Polity scientists assumed dead as well as destroying the factory. As they pull out almost successfully, they encounter a familiar enemy. The writing and performances in ‘The Best Defense’ continue to make gen:LOCK a strong show, balancing drama – the Holons in action as well as highlighting the pilot’s personal demons and developing their relationships with each other – and comedy, based in the dialogue between characters. However, this episode also leaves us with a lot of questions that will hopefully be answered in the future. This is the first time the audience takes a look into the digitized mind of the Holon, which is reminiscent of the Ether. The menu that Cammie goes into is titled ‘Self Modification Code’. When Dr Weller gets a prompt that Cammie has adjusted the settings, he doesn’t do anything to change it at first, instead surveying her. Though he has a couple of words with Cammie after the experience, clearly aware that she is scarred from her experience with Nemesis and describing her episode as a ‘psychotic feedback loop’, it isn’t until Leon (Played by Gray Haddock) tells him to pull her out of the Holon that he actually does. Did he approach the situation as a scientist watching an experiment take place? Also, the gen:LOCK recruits describe it as hacking her code, but it was clear as day on a menu with sliders. Did Weller leave it there on purpose, knowing one of the recruits would get too curious? In the cafeteria scene, it is revealed that each of the recruits have dreams like Cammie’s, with some minor differences. How come Dr Weller hasn’t brought it up, or how come the gen:LOCK team haven’t brought it to his attention? They are the first of their kind, and the doctor seems like the kind of person who’d want to know every detail about his operation. Chase also confirms an observation from the previous episode: ‘Just coz you don’t take physical damage doesn’t mean you’re not affected’. It’s clear the dreams are a side effect of running the Holons, but do they get worse over time or worse the more damage a Holon takes, a way of compensating for the physical punishment the mechs receive? In the briefing room, Chase and Miranda whisper amongst themselves, while Jodie – who is sitting next to Miranda – briefly looks from the periphery of his vision, seemingly curious. When Chase and Miranda speak face to face in the briefing room, Jodie walks out annoyed. Though love triangles are oversaturated, by this small scene, it’s a clear hint this is the direction their relationship is taking. However, more of Miranda and Chase’s relationship develops – Miranda asks Chase if he had ever thought about going back to the Vanguard, perhaps as a commander instead of a solider. Chase replies that due to his injuries, the only way he feels he can do any good in the war is from a Holon, fighting as a form of vengeance for a life which was stolen from him by the Union. Before deployment, the gen:LOCK team are treated to new upgrades, looking more and more like they do in the introduction sequence: Kazu gets a giant sword and some extra armour plating for his Holon, Cammie gets some drones that assist her with her aiming as well as hacking capabilities, while Chase and Yasamin get sets of wings to make their Holons fly. While all the other upgrades are from Weller, Chase’s was a gift from Migas. A thing to note about the wing design on Chase’s Holon is that looks they have been stripped from the fighter jets that the Vanguard used in the New York attack. The final battle scene is where most of this episode’s comedy comes from, as one of the Polity scientists (played by SungWho Cho) makes a lot of sarcastic remarks as he is being taken into the facility – ‘I always wanted a lab with a view, some peace and quiet, focus on my work. Never occurred to me to use barbed wire and armed guards. Nice touch.’ – and admiring his rescuers – ‘I think I’m in love…with your mech’. Also, in addition to the romantic aspect of their relationship, Valentina and Kazu also seem to share one similar to Gimli and Leoglas’ in the Lord of the Rings franchise, keeping a tally of the damage they’ve done, and Kazu pointing out ‘That one still counts as mine’ when Valentina shoots an anti-aircraft cannon. The whole episode is beautifully animated as always, but the siege of the factory is a particular delight to look at, bathed in a background of warm colours, where Nemesis and the Union forces contrast starkly against. From an analytic perspective, it could be noted that this is quite literally a new dawn for the Vanguard. It also features the Union’s mech Nemesis speaking for the first time: ‘You think too loud. You haven’t shut up since your birthday.’ This is a very strange thing to say, as the only character to refer to birthdays was Dr Weller, who wished the gen:LOCK crew a happy second birthday in the third episode. When Chase questions the doctor as to why there was no follow up on their first encounter with Nemesis, he seems oddly distracted whereas previously he seemed all too chatty. Is Dr Weller somehow linked to the development of the Union’s mecha? Also, just based off the two encounters the gen:LOCK recruits have had with Nemesis, it always conveniently escapes when the team pull together, a clear hint that the mecha does have its weaknesses, as menacing as it is. ‘The Best Defense’ sees a fan favourite character recover from her encounter, as well as showing the audience a dramatic battle sequence in which the good guys are no longer on the run.